Will the country finally have its first woman as central bank governor? 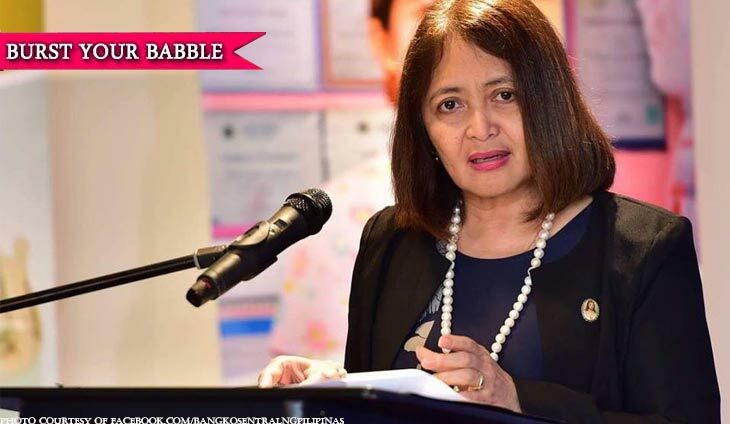 Based on our Babbler’s intel, this has become a possibility after Bangko Sentral ng Pilipinas Deputy Governor Chuchi G. Fonacier has emerged as one of the favorites on who’d replace the ailing Governor Nestor A. Espenilla Jr.
A few months after Espenilla was appointed governor in May 2017, the Monetary Board promoted Fonacier as deputy governor in charge of bank supervision and examination. Fonacier, who started as a BSP bank examiner in 1984, is a Certified Public Accountant. Fonacier was a graduate of La Salle College-Bacolod and has a Master in Business Administration from the Ateneo de Manila University. She is a fierce advocate of having more girl bosses in government and private sector. Espenilla has taken an indefinite leave of absence (initially announced as a two-week rest) nearly four months ago and there has been no official word on his return. Espenilla was diagnosed with early stage tongue cancer in November 2017 and continues to be under treatment. The guessing game on his possible replacement has ramped up with BSP officials opting to stay mum on the state of health of the most powerful banking official in the country. Aside from Fonacier, veteran banker Peter Favila, a member of the Monetary Board, remains one of the top picks for the BSP post.